Triple-chain gold necklace by designer Shlomit Ofir has an abstract flower ornament as its focal point. Jewelry designer Shlomit Ofir embellishes on her use of multiple chains in this distinctive asymmetrical pearl bead and gold necklace. Three chains of different lengths and complementary styles are plated in 24 karat gold. The three chains are joined together at the base of an abstract gold filigree embellishment, which rests at the side of the wearer's neck. 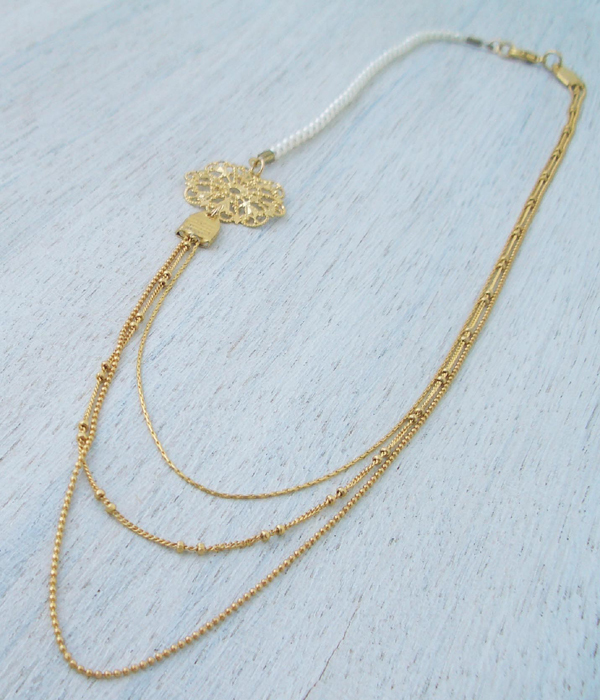 The visual complexity of the handcrafted gold and pearl necklace is varied by a rope of glass pearl beads that join the top of the filigree flower to the other end of the three gold plated chains. This unusual combination of pearl beads, gold filigree and classic gold chains makes the necklace a wearable conversation piece that will be a hit with fans of pearl jewelry and gold jewelry. The glass pearl beads comprise a 6 inch (15 cm) section of the necklace. 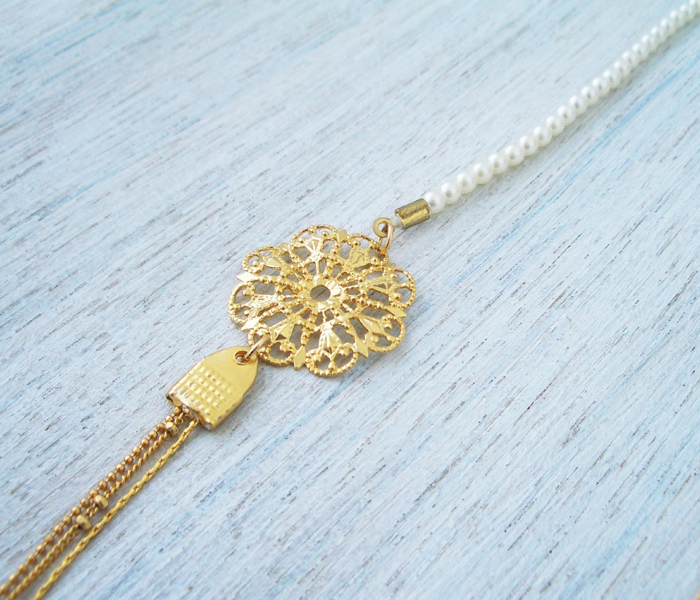 The gold plated filigree flower measures 0.9 inch (2.3 cm) in diameter so as not to overpower the effect of the gold and the pearl elements. In total, the handmade necklace measures just under 19 inch (48 cm). Shlomit Ofir's elegant gold plated and silver plated designs, which are inspired in a large part by the natural world, make fine additions to any collection of modern Israeli jewelry, nature jewelry, and handmade fashion accessories.